It's Saturday morning and you're taking the baby out for the day while your wife catches up on some much needed rest (we can dream can't we?). The little one is dressed, fed, dry, and the changing bag is packed and ready to go, so you just need to grab it and head out the door, right? Wrong. Chances are that while you were in charge of hunting through your Man Drawer looking for just the right tool to assemble the bugaboo, your wife was in charge of picking out baby clothes, nursing bras and changing bags. The bag she's chosen is just perfect - it's sophisticated, stylish, and practical... and...errrm.... covered in enormous colourful butterflies. Looks great, and it even comes with its own changing mat, but how does it measure up? 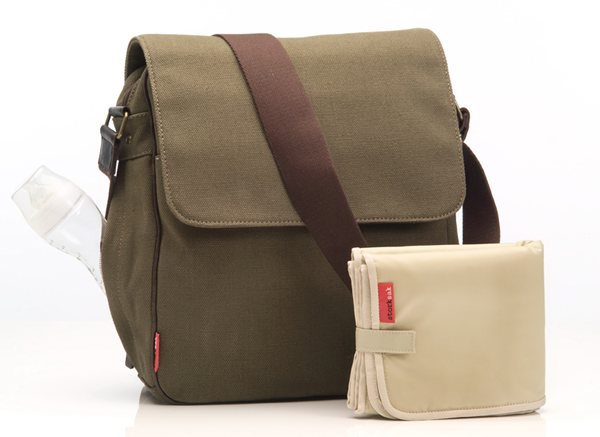 In terms of style, this bag could easy be passed off as an every day messenger bag, and is actually designed to fit most laptops. We decided instead to work with its rugged yet boyish "I made you a mix tape" feel and fill it with some classic vinyl. In theory it fits about 20 records, including Grandmaster Flash & the Furious Five "The Message", but we would recommend a maximum of 3 if you are also going to leave room for some nappies, wipes and other baby essentials. The Alex Messenger bag passed our "out for the day with two under two" test with flying colours. With very little effort, I managed to pack a change of clothes for two babies, a few spare vests, 2 muslins, 6 size 5 nappies, a pack of wipes, a little pot of Sudocrem, teething gel, two bibs, a formula powder dispenser, two packs of Plum Baby, 2 boxes of Organix raisins, a flip-the-flap book, and... well, you get the picture. Somewhat incredibly, I then tucked not one but two Tommee Tippee bottles (the widest on the market) into the insulated pockets, as well as a copy of Freakonomics for Dad to read in the park in case the babies fall asleep. Amazingly it still looked like a could get a few more things in - if only I had a Y chromosome and knew how to pack a bag more effectively. It looks small from the outside, but seems to be some sort of nappy TARDIS. The Alex is wipe clean, has loads of useful little pockets, a detachable keyring, and everything else you could possibly need. The only drawback I can find is that you need to buy some stroller clips separately in order to attach it to your buggy. There you have it. Stylish, practical and no butterflies - finally a baby bag just for you. * It has been done. He was 2, and yes, his bottom was really smooth for a really long time.